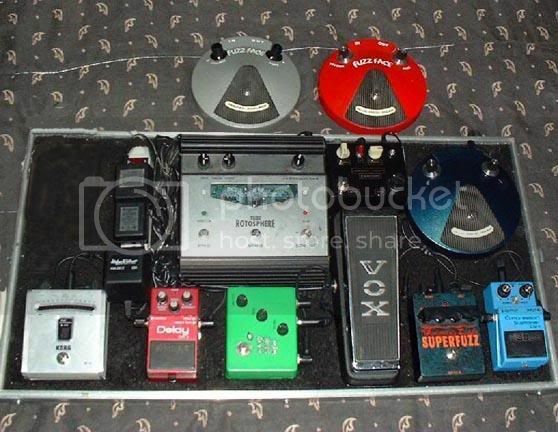 Discussion in 'Effects, Pedals, Strings & Things' started by eric-d, Aug 31, 2008. I've owned this Fuzz Face shell for about three years. It came to me with the stock Dunlop parts in it and it wasn't working. The previous owner had drilled a hole on the shell for what I believe was another pot (maybe for tone, bias, or an LED). There was also a notch on the side for what could have been for a power cable. The previous owner repainted it silver and that's how I got it. Here's how it looked when I got the unit. The "Sharpie" logo's are in my hand writing. This was in 2005. I sent it to Analog.Man and had him install the NKT-275's and other goods to get it up to snuff and I used it like this for some time. I repainted it in Silver Hammerite and hand painted the logo with Black "Sign" paint. I took the NKT "guts" out and had them rehoused in a Sunface Housing and then proceeded to put a BC-108 BYOC guts into the shell. This is what it looked like for about 2 years. I was never happy with the sound of it. I don't think the BC's were balanced worth a crap - so in turn it sounded like crap. The material that was used to fill the hole had crumbled so I utilized it for the LED bezel. NOW - since I've never liked the shell in such ****** condition and to have the tone of this pedal about as horrible as a Fuzz Face can sound - I though I'd take my time and refurbish the whole thing. I'm doing it in PTP and PNP Germanium. I'm doing almost all Vintage styling/NOS components when it's available. I filled the hole that was there with JB Weld and sanded the whole shell to its bare smooth aluminum natural state. I went with Hammerite Blue. I got some repro knobs and I made the Rubber Tread (Since the old one was ripped damn near in half and had a **** load of glue residue). I'm going to paint the logo's on (This version is PHOTOSHOPPED - just to see what the final product will look like. I do not have all the components yet. I have done a few summers ago. Very cool. Where did you get those knobs? A friend had a set for me. Where'd you get that circuit board? I'm looking for that!! Sweet. It's a silicon MJM London Fuzz in a fuzz face shell. What blue paint did you use? Thanks man! I'm still working on it. I've got parts coming in from all over! Just got to piece it all together. Nice refurb!! I'm considering custom painting one. I saw one recently painted by hand and got the itch!! Send any ugly old red enclosures my way! 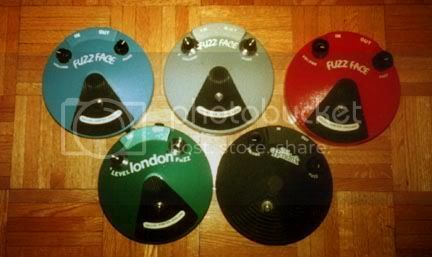 I used to own a "Treble and Bass Face" back in the sixties - never seen another since.....(I also had A Marshall Supa Fuzz/Wah - which every one except John Phillips said "never existed" - you could choose which component came first). Great work i must say. When i bought my FF i thought i was going to rehouse it, i even bought a box for it, that i have to repaint because the paint was still wet when it was wrapped, or at least wasn't dry enough, nice beautiful work anyway. well, the thing is that i have fallen in love with my turtle, err, FF and the way it looks and i don't want to rehouse it anymore, i just love it! I've seen a couple... A friend of mine here in Houston has one. I know AnalogMike has at least one himself too. I dunno - I like the FF knobs better..... It's still a cool pedal though. you know what is totally f*cked up? I never noticed that they looked like a big ole smiley face before. ever!!!! nice job, by the way. . .